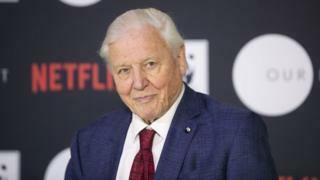 Sir David Attenborough is to narrate a documentary series for streaming service Netflix about “the beauty and fragility of our natural world”. It has been produced in collaboration with Silverback Films, whose director Alastair Fothergill made Planet Earth and The Blue Planet for the BBC. Speaking at a World Wildlife Fund (WWF) event on Thursday, Sir David said the eight-part series would “take viewers on a spectacular journey of discovery”. The series took four years to film. The 92-year-old broadcaster said he was “delighted to help bring this important story to millions of people worldwide”. It is a collaboration between Netflix, the WWF and Silverback Films. Our Planet marks the first Netflix series for Sir David, who has previously fronted programmes for Sky and digital channel Eden. His latest series, Dynasties, begins on Sunday on BBC One.